Lenggang, Tekwan, Model, or Rujak Mie. Pempek, mpek-mpek or empek-empek is a savoury fishcake delicacy from Palembang,South Sumatera, Indonesia, made of fish and tapioca. Pempek is served with rich sweet and sour sauce called kuah cuka or kuah cuko (lit. vinegar sauce), or just "cuko". Sometimes local people also add yellow noodles for variations. Pempek is the best-known of Palembang's dishes. Its origin is undoubtedly Palembang. However, the history behind the creation of this savoury dish is unclear. According to local tradition, around the 16th century there was an old Chinese immigrant who lived near the Musi river. He noticed an abundance of fish caught by the local fishermen. In the Sumatran tropical climate, before the invention of refrigeration technology, most of these unsold leftover fish decayed and were wasted. The indigenous people, however had limited knowledge and techniques for processing fish. During that period, most of the indigenous people simply grilled, fried or boiled their fish instead of adding other ingredients to make new dishes. The old Chinese man mixed in some tapioca and other spices, which he then sold around the village on his cart. The people referred to this old man as 'pek-apek, where apek is a Chinese slang word to call an old man. 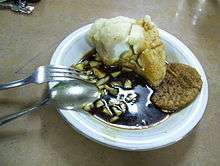 The food is known today as empek-empek or pempek. Another theory suggests that pempek was a Palembang adaptation of Southern Chinese ngo hiang or kekkian (fish slice) as a surimi (魚漿, yújiāng) based food. But instead of being served in soup or plainly fried, pempek is notable for its spicy palm sugar-vinegar based sauce. Pempek dough is the base of various shaped pempeks. Pempek dough is made from a mixture of boneless ground fish meat, most commonly tenggiri (wahoo), with water, salt and sago flour. People sometimes add a little bit of cooking oil and/or wheat flour to improve texture and not to make the pempek too chewy and to add MSG to enrich the umami taste. Ikan gabus (snakehead) is also commonly made as pempek. Numerous pempek sellers and producers in Palembang use a cheap combination of fish, which has a strong scent. According to tradition, the best tasting pempek are made of belida or belido (Chitala lopis), but due to its rarity and superior taste, pempek made from this fish are usually more expensive. Pempek in Bangka Island are made from mackerel (ikan kembung) and its sauce is red chilli based, while in Jakarta or other cities they could be made from gourami fish. The latest variant is pempek udang, pempek made of minced shrimp originated from Sungsang area in Banyuasin near the Musi river estuary, it is noticeable with its pinkish color. The dough is boiled in hot water or steamed until hardened as partly cooked dumplings, and stored to be fried later just before serving. Kuah cuko is produced by adding palm sugar, chili pepper, garlic, vinegar, and salt to boiling water. The color of this sauce is dark brown. Sometimes Tongcai and Ebi (ground dried shrimp) are also added to increase the flavor. This sweet, sour and spicy sauce is essential for flavouring the pempek, since the pempek dough is very mildly savoury. The sauce of Bangka pempek is chili based, made from the mixture of ground red chili and vinegar and its color is bright red. Traditionally all pempek sauces are served hot and spicy, the ground chilies are mixed in the sauce. However, since some people desire unspicy sauce, or cannot eat hot and spicy sauce, the ground chillis were often separated as sambals. In some pempek restaurants, the bottled kuah cuko sauce is left on customers' tables and they are welcome to pour on the amount of sauce they desire. There are two kind of sauces available, spicy hot and plain. The boiled or steamed pempek dumplings are deep-fried in cooking oil until light pale brown right before serving. They are cut in bite-size, served with yellow noodles or rice vermicelli, showered in kuah cuko, and sprinkled with chopped cucumber and ebi powder. The additional fish krupuk crackers might be offered. Pempek kapal selam and keriting in kuah cuko. Pempek kapal selam: (Indonesian: submarine pempek), which is made from a chicken egg wrapped within the pempek dough and then deep-fried. The shape is similar to Chinese dumplings but larger in size. According to food science and technology scientist, the pempek kapal selam, with egg addition, is rich in protein, fat, vitamin a, mineral, and carbohydrate content, is the most nutritious variety. The name derived from the shape of pempek that resembles submersible midget submarine. Pempek kapal selam and kulit. Pempek telur kecil: (Indonesian: small egg pempek), filled with egg similar to pempek kapal selam, but smaller in size. Pempek lenjer: long cylindrical pempek, its shape is similar to sausages. Pempek keriting: (Indonesian: curly pempek), the dough is made into small noodle ball. This similar process also applied to produce white krupuk. Pempek pistel: the shape and size is similar to pempek telur kecil, but filled with minced young papaya instead. Pempek kulit: (Indonesian: skin pempek), fish-skin pempek, the dough is mixed with minced fish skin, as the result it has stronger fishy aroma and darker color. Pempek adaan: ball shaped pempek. Pempek tahu: tofu sliced and filled with pempek dough. Pempek Tunu: charcoal-grilled pempek. It is stuffed with ebi, sweet kecap sauce and chilli sauce. Pempek model (Model Iwak): tofu wrapped inside pempek dough. Similar to pempek kapal selam, but egg is replaced with tofu. Instead of served with cuko, it is served in shrimp soup. Most of those pempek in various forms are deep fried in cooking oil until light pale brown, and served with yellow noodles or rice vermicelli and kuah cuko, sprinkled with chopped cucumber and ebi powder. Celimpungan: small pempek balls cooked in spicy coconut milk, served with chilli and sprinkled with bawang goreng (fried shallots). Laksan: often referred to as Palembang style pempek in laksa soup, sliced pempek fishcake served in coconut milk based soup. Lenggang: omelette with mixture of sliced pempek fishcake, also served in kuah cuko. Tekwan: chopped pempek fishcake soup with jicama, mushroom and fishballs. As a local specialty, pempek can be commonly found on every street in Palembang with a concentration of outlets in downtown Palembang. Pempek can also be found in other regions, especially in major cities in Indonesia. However, the taste of pempek in other regions are usually different to pempek from Palembang. The main ingredients such as fish and flour are scarce and/or difficult to find in other regions, causing the difference in taste. Pempek is easy to find in Jakarta and other Indonesian cities, from the food-courts in malls and shopping centers to traveling pempek vendors on cart. The cheaper pempek version sold by traveling vendors on cart generally use less fish and more tapioca, resulting a more flavorless taste. Pempek is also a popular dish in South Sumatra's neighboring province capital city Bandar Lampung. Some pempek establishments, such as Pempek Pak Raden and Pempek Bunga Mas are opening branches all over major foodcourts. In Jakarta, the notable pempek outlets are Pempek Megaria in Metropole cinema complex, Central Jakarta. It is among the oldest pempek establishment in the city. Other pempek outlets are those in Pasar Minggu market, South Jakarta. In Yogyakarta one of leading pempek establishment in the city is Pempek Ny. Kamto located near Malioboro street. Outside Indonesia, pempek establishments can be found in Singapore, Malaysia and Australia. As Palembang is located quite not far from Singapore and Malaysia, to ensure the authenticity, some pempek establishments import boiled unfried frozen pempek dumplings in vacuum packages straight from Palembang. These ready to cook pempek dumplings are also popularly sold in Palembang as oleh-oleh foodstuff gifts or souvenirs for visitors from other Indonesian cities. ↑ Kompas.com Mau Coba 15 Macam Pempek? ↑ Fairy Mahdzan: Potty for Pempek Palembang!